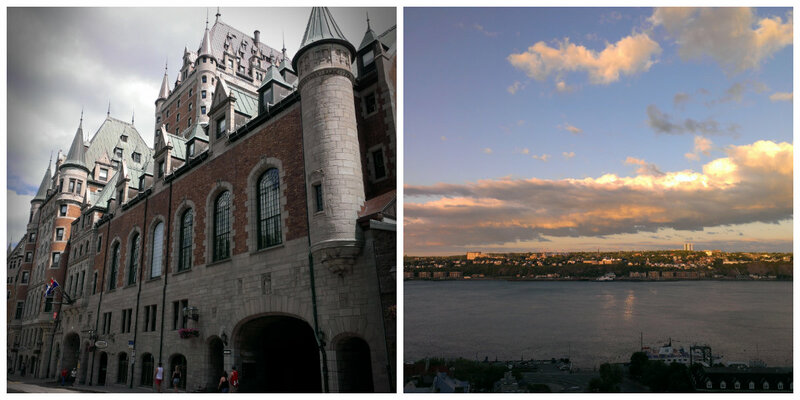 What a lovely second full day in Quebec! We crammed a lot into this day but it was also a lot of fun! Our morning started with a trip outside the old walls of the city to the Citadelle for the Changing of the Guard Ceremony. It was super windy – seriously felt like a tropical storm (at least!). It made for a really cold morning so we were very thankful for the mostly sun-filled sky to keep us slightly warmer. Out of two or three experiences watching a changing of the guard ceremony, this is the first time I’ve actually been able to see what’s happening. Inside the fort is the parade grounds – a very large, open area which we spectators circled around. Front row views for everyone! The ceremony lasted about thirty minutes and it was just so ridiculously windy the entire time. The gusts would almost knock us over! 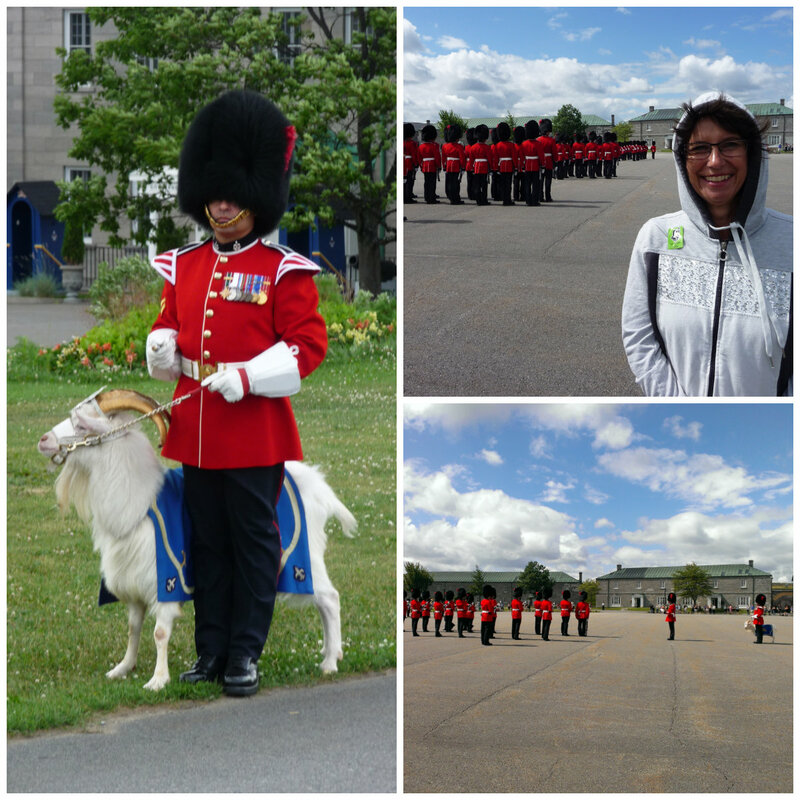 But we still enjoyed the formal ceremony and especially enjoyed watching the regimental mascot, Batisse the Goat. Yes, a goat. 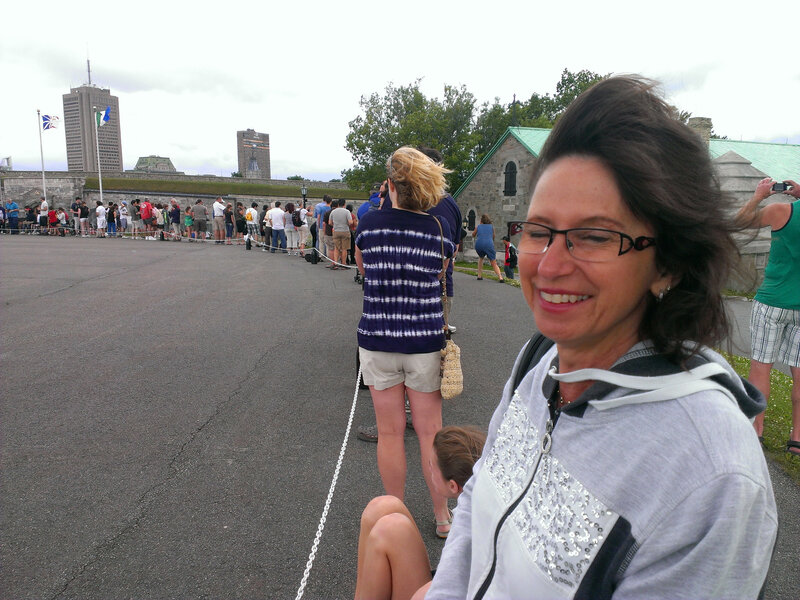 Once the ceremony was over, we joined an English-speaking tour of the citadelle. It lasted about an hour and was very informative as we learned about the history of the fort, as well as more Quebec history (I do love history!). The citadelle is built on one of the highest points of the city so we had some really great views of Old Quebec and the river. From there we headed back to our apartment for a cheap lunch of PB&J’s and fruit. 🙂 Then it was back out to walk to the Old Port of Quebec and visit the market located there. Our walk took us through areas of Quebec we hadn’t yet visited. It was also a very steep downhill walk – which meant, of course, that our trip back was going to be…a very steep uphill climb. 😛 Oh well! The Marché du Vieux-Port Québec is an indoor public market open year-round, located between the Gare du Palais and the Old Port. It was smaller than I was expecting but we still enjoyed perusing the various items for sale. And we were very excited to find all three items we were looking to purchase: cheese, dessert for the evening, and macaroons! 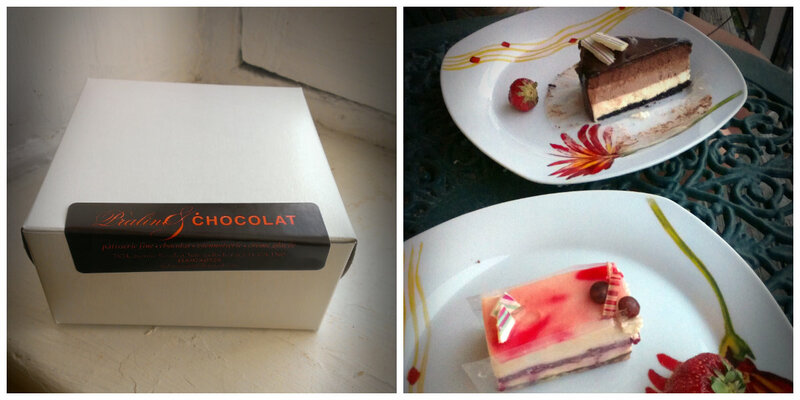 I had the amazing and swoon-worthy blackcurrant and basil flavor – oh my word!!! Soooo good! Across from the bakery was a fromagerie and, assisted by the sweetest lady, we picked out some wonderful cheese. We really wish we had visited this market sooner during our stay so we could have bought more fresh food to eat! Leaving the market, we walked along the Old Port and the river until we came to a most lovely and incredibly quaint part of the Lower Town. We both loved this area which surrounds Place Royale! Located in the square that is the Place Royale is the Notre Dame des Victoires Church which we entered and looked around for a bit. After visiting a few shops in the area, we decided to take the funicular back up to the walled part of the city. 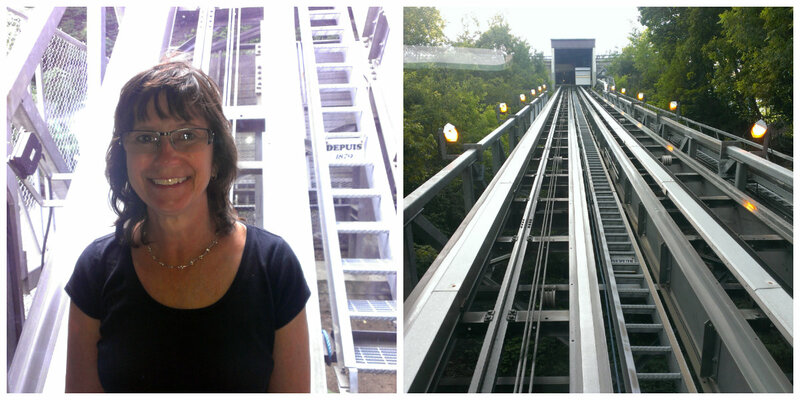 I had ridden a funicular before in Germany and again in Salzburg, but this was Georgann’s first time. A funicular is a type of outdoor elevator/train – I’m not sure how else to describe it! It dropped us off on the promenade in front of the Chateau Frontenac. That evening we dined at Bello Ristorante which had been recommended to us by our Airbnb hostess, Vivienne. This restaurant was fantastic! The atmosphere was great, the food was delicious and the service was superb! We actually sat outside on the patio and enjoyed the beautiful evening. 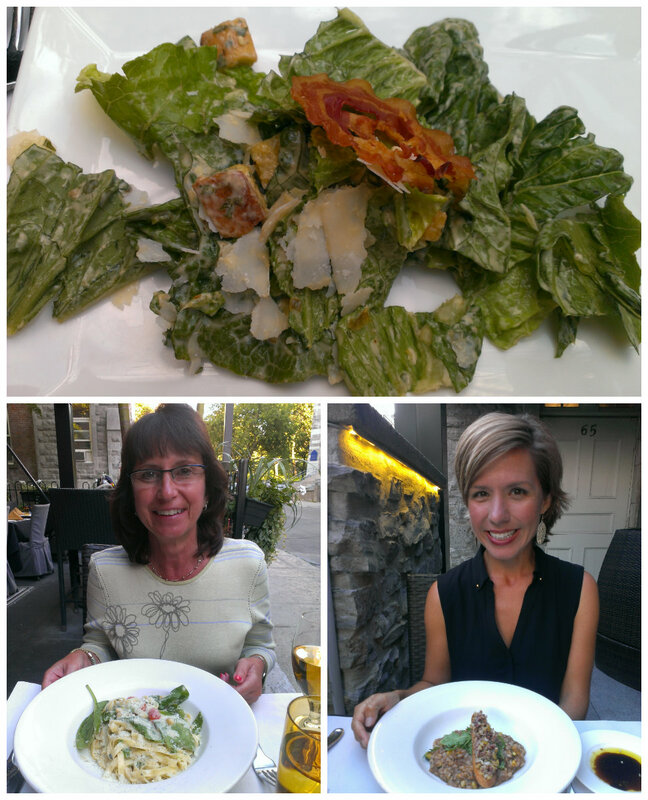 We started with a shared caesar salad that was prepared table-side. For our entrees, Georgann had tagliatelle with gorgonzola sauce and I had an amazing risotto with braised lamb, green olives and sage. So yummy!! After dinner we walked around a bit and visited a couple of nearby churches, but the temperature was starting to drop and the wind was picking up so we didn’t wander too far before heading back to our apartment. We made a quick stop at the Chateau Frontenac to walk through the lobby and see the inside of this old castle-turned-hotel. I actually found it really sad to see this huge and beautiful castle being used as a modern hotel. Although there are remnants inside of the original building, most of the interior appears to be new. Guided tours used to be offered but have been discontinued. I would really like to learn about the history of this chateau. Back at our apartment, we brought our yummy desserts out onto our little balcony and enjoyed the sweet treats while chatting as the late-setting sun made it’s descent. The Changing of the Guard ceremony is presented at the Quebec Citadelle daily at 10:00am from June 24th – September 1st and lasts around 35 minutes. 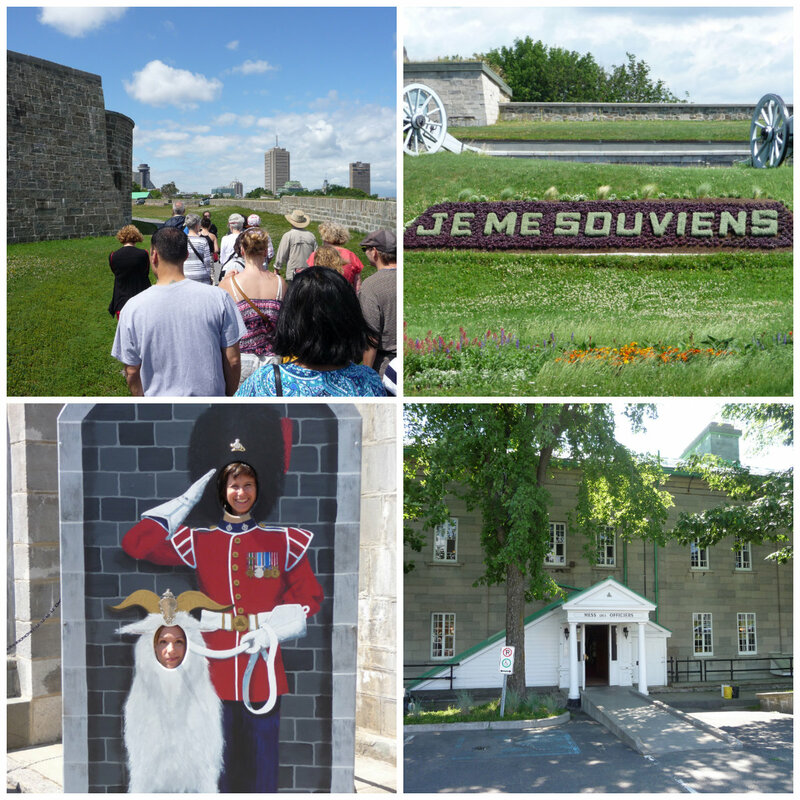 Admission to the Citadelle (which includes the ceremony, tour, and museum) is $16 CAD for adults. 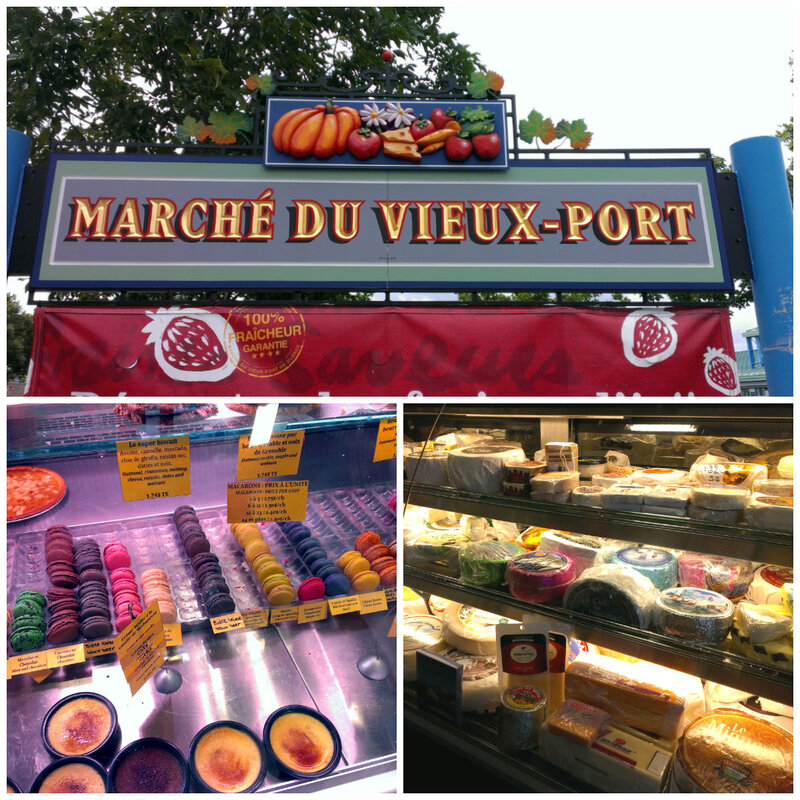 The Old Port Market is open Monday – Friday, 9:00am – 6:00pm and Saturday and Sunday, 9:00am – 5:00pm. Although it’s on the smallish size, it still has a lot of delicious-looking goods for sale. 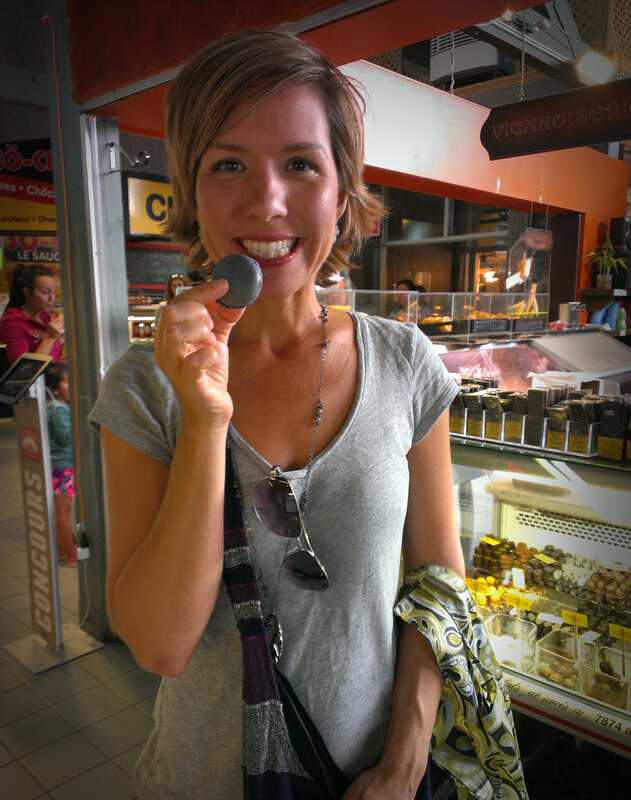 Definitely visit Praline et Chocolat for some amazing macaroons and other yummy sweets! 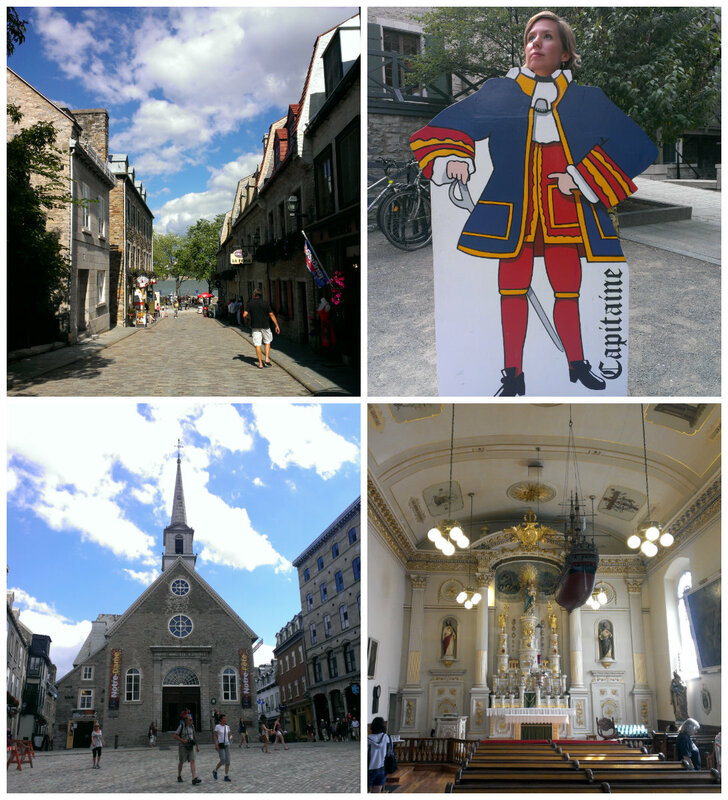 If you ever find yourself in Quebec City, please don’t just stay in the old walled part of the city! The Lower Town is just as -if not more so – quaint! And it seemed a bit less “touristy” to me. Much quieter and just so lovely! A trip on the funicular will cost you $2.25 CAD each way but will save you a lot of walking and stair climbing to get up to or down from the Old City. I only took it once (I do so love to walk and climb stairs! ), but Georgann took advantage of it a couple more times during our visit. It runs daily from about 7:30am to around 11:30pm. Canada + Food = YUM!! !